Amax Interactive brings you the latest chilling installment of the Redemption Cemetery series! When Santa Muerte calls to you for help, you rush to her aid. When you arrive to the cemetery, you find the powerful spirit preparing for a fight to save the world. An evil deity wants to turn your home into the land of the dead, and only you can stop him! Do you have what it takes to save souls from his grasp before it’s too late? Find out in this spine-tingling Hidden-Object Puzzle adventure! 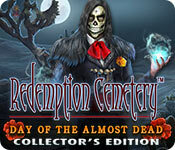 Redemption Cemetery: Day of the Almost Dead Collector's Edition is rated 3.1 out of 5 by 24. Rated 5 out of 5 by pvsquare from I like this series of games. Very good game I like the graphics, sound and the characters. Rated 5 out of 5 by gamer_girl_09 from Redemption Cemetery Redeemed! I downloaded the trial version in spite of not so many stars and a few less than sterling reviews, mainly because the RC series is one of my favorites, and too, I understand that not everyone agree's on what makes a game good or bad. I ended up buying the game after playing the trial and here is my honest review: First of all, I will admit that one or two in the series left me feeling that they had been created by a couple of newbies who had wandered off the tried and true path the Sr creators had paved, and I was less than impressed. They must have handed the reins back to the seasoned developers because it was exactly what I have come to expect from them! The graphics are glorious and the game sticks to a clearly written story line. It is the usual adventure of going back in time through portals and preventing the deaths of someone in order to free a soul needed by evil in order to take over the mortal world, but that is exactly what it's suppose to be. Redeeming souls in the cemetery, just like the name suggest. A new twist on HOGs (for me anyway) was where you find hidden objects by turning a wheel and lining up the item. The maze was one of my favorites. The path from start to finish was already lined out for you, but along the way there were obstacles that you would need to go in search of something to remove it from in your way. Some of the usual were finding pairs to eliminate a pile and using your cursor to drag a ball through a path without touching the edges. That is one of my least favorites, but at least these were not as difficult as I've seen in other games. Gathering items for recipes and crystals. There are collectibles, but I didn't see morphing objects. Bonus play in the CE was just as much fun as the game, and you must play it in order to send the evil Shibalba back to the land of the dead and seal that crack closed forever, but ending dialogue leaves no question about it, you will soon be needed again, at another cemetery, in another place and time, to help more tortured souls redeem themselves. Rated 5 out of 5 by rjohn82677 from Redemption Cemetery:Day of the Almost Dead ABSOLUTELY SUPERIOR! I have played every game of this series and this one by far THE BEST. The different stories in which the player must save a soul are GREAT. 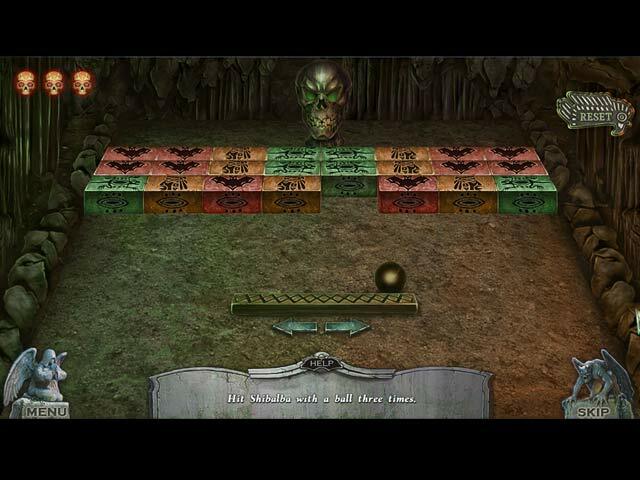 The player has to follow the directions and solve the puzzles in order to save a soul and then the player is sent on another quest until all souls are saved. The graphics and the colors are Incredible! Because I speak Spanish and spent a lot of time in México, the Día de Los Muertos is a celebration that I know well. The vibrant colors are very accurate. 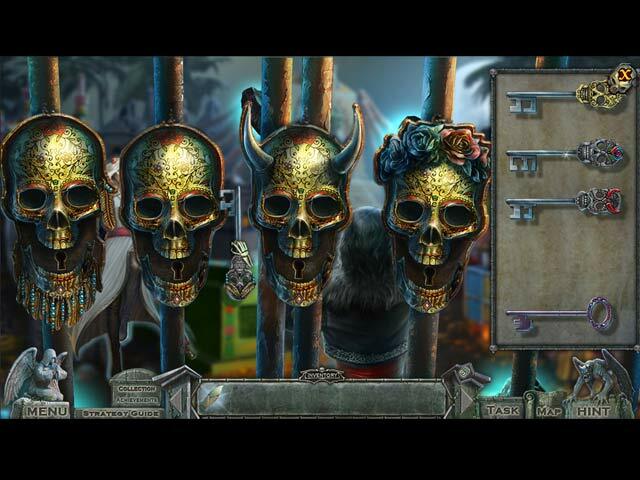 The "Redemption Cemetery Series of games" are a joy; especially when they are set in México. Bravo for another great game. Rated 5 out of 5 by LogieBaby from The game deviates from Mayan mythology but who cares as this is one fantastic Redemption Cemetery !! I was included in the beta testing of this game at least 2 months ago and have anticipated its release since then and I for one am sure glad it is finally offered. Let me begin with some facts about Mayan myths and the Day of the Dead. Shibalba ( correctly spelled Xibalba ) does not have a humanoid form as is presented in this game. In fact Xibalba is the underworld of Mayan mythology that is ruled by the 12 death gods the leader of which is Hun-Came ( one death ). Its second in command is Vucub- Came ( seven deaths). The remaining 10 lords are demons given domain over forms of human suffering. They include Ahalpuh ( pus demon ) and Xiquiripat ( flying scab ) among the others. So humanizing Shibalba is absolutely contrary to the mythology. Having said that, this is nevertheless an outstanding game. There have been lots of Redemption Cemetery games over the years and I was enthralled with the initial couple of them. As the series continued a definite lack of originality became the norm as is the case with so many serialized games. This being the case a level of boredom ensued. Fortunately with Day of the Almost Dead, Redemption Cemetary returns to a lofty perch in the HOPA world. For starters I can recall only one other game based on the Day of the Dead, a rather tongue in cheek issue called Calavera in and of itself a terrific game. So seeing this RC infused something new that is so lacking in too many games. Here we have Shibalba needing to acquire 3 more human souls to ensconce himself as ruler of the living as well as the dead. The player is tasked with preventing such an occurrence. The drawing and graphics in this game are top-notch and navigating within game sections is a breeze. 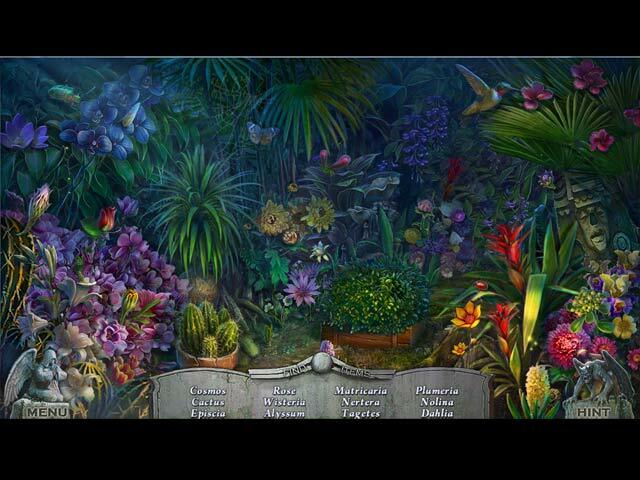 The demo does not include too many hidden object segments while there are lots of fascinating if not unique puzzles. During the demo I did not come across morphs and/or collectibles nor was I seeking them out as I was so engrossed in game play. There are not too many games these days that I consider worthy of purchase primarily due to so much been there done that feelings. Day of the Almost Dead is at long last something players who are as tired as I am with the same old same old can sink their teeth into a wonderful game. I need to end this so I can buy a great game. Rated 4 out of 5 by Majestyx12 from Happy to see the Cutest Little Raven Helper Again I liked the story and the game play. Could use more full size hops and extras like morphs. The circle hops were my favorite. Some other hops didn't have enough items. Liked the 11 collectible mythical gods. Had some interesting info. The marigolds galore is nice. Way too many mini-hops. I liked a few mini-games. My favorite being the colored gems that you had to move from one spot to the right spot. My second favorite was hitting Shibalba 3 times game ball style. I liked putting the stars in the right place. Liked shooting the eyes and timing the needle just right. Really didn't like the drag the puzzle vertical and horizontal. Or the fool with it puzzles. Didn't like the map game. The match three or more, moved at a snail's pace. The 10 sec. wait for skip and hint is too long. The history how the people who you saved was interesting. The masses of people who you release was good. The guide needs bigger pictures. Replays are good. 13 hops, 18 mini-games, 19 movies. 12 wallpapers and 7 screensavers. Five Chapters + Bonus. Rated 4 out of 5 by Marja67 from Good Game. I liked it. Pretty graphics and story line. Rated 4 out of 5 by Hersheyguy1 from HELPING THE DEAD WHEN THEY WERE ALMOST DEAD! DOES THAT MAKE SENSE? We have three more souls in another edition of Redemption Cemetery! Overall, I found this installment to be pretty enjoyable with a few flaws, however, these flaws do not wreck the entirety of the gaming experience. Amax Interactive always delivers on the production of graphics. They are crisp, clean, and are beautifully hand drawn. The audio is obviously recycled from past editions of this series, so it does not add to the quality of the game. I’ve actually heard some of the sound effects that Amax uses in horror movies! The level of challenge is actually solid because of the option to change the difficulty of the puzzles and there is a good mix of challenging and more relaxed puzzles. The HOS are boring and the scenes are recycled, which demonstrates a lack of creativity and decreases the fun factor. The pace, however, is consistent and fast, which is my favorite. My true rating is 3.5, but I decided to round it up to 4 because of the Day of the Dead theme and fun collectibles that have fun facts about Mayan Gods. The following the list contains all of the positives and negatives. Please note that reviews are subjective, so they are opinion based. My preferences will be different than other players. Pros: - Graphics are fantastic! - Storyline is understandable and easy to follow. We don’t get too many Day of the Dead stories. - Pace is quick and consistent. - Some puzzles have an option to change the difficulty, and there is a good mix of challenging and easy. - Raven helper is not annoying and will please helper lovers and haters. - Collectibles contain fun facts which I like to read! Cons: - HOS scenes are boring and recycled - Characters are stiff when they talk. Only their mouths move and mouthing else. - Dialogue choices don’t effect the game. - Puzzles are not original and are boring. Rated 4 out of 5 by Totty_Tara from OMGGGGGGGGG (to infinity and beyond!) JUST THE DEMO! This series just keeps getting better and better! The devs find ways to up their game in every episode and I for one appreciate that SO much. Everything about this I enjoy - graphics, sound, storyline, well the whole deal. I don't often review but this just had to be! If you're wondering why I didn't give it 5 I very rarely do unless a game is perfect and when is the perfect game coming? My guess is never (hopefully cos when that happens gaming maybe dies!) . Enjoy like you've never enjoyed before fellow gamers! Rated 4 out of 5 by sunnyglow from BRING DEATH BACK TO LIFE IN A DEATH-DEFYING GAME! OVERVIEW: ¡Feliz Día de los Muertos! (Happy Day of the Dead) Actually not! Celebrants for this Mexican holiday are disappearing within a cemetery. As part of the Myth Debunker Forum, you have been contacted by Santa Muerte for help in preventing Shibalba, the god of death, from rising from the Underworld. His accomplice, Kalaka, is aiding him by locating souls for him to feed upon in exchange for immortality. You are the last hope! Once Shibalba seizes three more souls to feed upon, he will resurrect from the Underworld to claim the world of the living. Only you can stop the world of the living turning into the world of the dead. Enter his caves, find his lair and destroy his ambitions! OPINION: As a collector of Day of the Dead artwork, I was anxious to play this game. That was before I played the demo. The graphics are just phenomenal in this game. The artists have truly captured the essence and spirit of this Mexican holiday. The story is excellent. Despite that, there are several reasons why it was a non-purchase for me. First, there is the annoying helper raven within the game. Second, I feel it is a snail-paced game. I became bored rather quickly playing the demo. Third, I disliked the animal noises throughout the game. You are told that the game is best played with sound. However, I can no longer stand hearing the background noises of baying of wolves and barking of dogs common in most of this developer’s games. HELPER: The raven returns in yet another AMAX game. He sits on your inventory bar and performs idiotic, time-consuming stunts. He is neither cute, amusing nor a logical part of the game. He is an unnecessary addition to this game, which, to me, is a time-waster. MECHANICS: There are the usual four (4) levels of play plus a customized version. There are twelve (12) achievements. Collect eleven (11) coins representing different cultures of the world. There is a replay of eighteen (18) puzzles and thirteen (13) HOP scenes. There are twelve (12) wallpapers, seven (7) screensavers, and the usual music and video selections. HOP SCENES: The scenes are thematic. They include some mini-HOP scenes as well in which you search for a small number of items. Most of the scenes are lists of items. The demo includes a storybook scene. I did not see any silhouette scenes in the demo. There is a replacement scene (placing items back into their proper place within a scene) which I thought was poorly done. One I did find very creative. It involves an etched window in which you must locate a specific number of four items, with those four numbers being used to open a lock. PUZZLES: The puzzles are excellent. They vary in style and difficulty; however, most of the puzzles are of middle difficulty. There is one in the demo which can be played in either a “Casual” or “Hard” mode. I found two of the puzzles in the demo very creative. In one you must create a maze by moving assembly-line blocks up-and-down- and sideways to create a path for water to flow. The other puzzle is a slat puzzle in which you must again, move slats up-and-down and sideways to create a picture SPOILERS: HERE ARE THE PUZZLES FROM THE DEMO: A. Switch puzzle. Switch gems above three (3) keys so that all four (4) like-colored gems are aggregated together above the like-colored key. Then, place them in numerical order based on the number on the gem. B. Switch puzzle. Switch pieces to create a button. C. Bullseye puzzle. Click on four (4) sliders when each slider is in the middle. D. Tracing puzzle. Slide a skull through a path without touching the sides. E. Choice between Casual and Hard. Sequence puzzle. Light all candles on an altar. Lighting one affects the others. F. Slat puzzle. Slide slats sideways and up-and-down to create an image. G. Sequence puzzle. Using two lenses, search a skull for symbols. H. Chess puzzle. In this variation, move colored skeletons to their appropriate colored slot by following the knight’s “L” move from chess. I. Switch puzzle. Switch puzzles pieces to create a picture. J. Moving tiles puzzle. Move tiles with cut--out sides into position to create an opening for a bird charm to be released. K. Assembly puzzle. First rotate four pieces then press the check button to see if, when they move, create a circular amulet. The pieces will rotate as they reach the center of the grid. L. Assembly puzzle. Rotate rings on three columns so that they create the image above each column M. Maze puzzle. Slide lines of rocks on a grid up-and-down and sideways to create a maze to lead water into the caves. N. Battle scene. Find matching pairs of symbols to take out an evildoer.